Most babies are keen to feed in the first 90 minutes after they are born especially if they are in skin-to-skin contact with their mum. If your baby is too sleepy to take this first feed or needs medical attention, it’s a good idea to ask your healthcare team to show you how to hand express and give the colostrum by teaspoon or syringe. He may sleep for a few hours after this first feed – feel free to cuddle him and wake him if you want to feed. He may feed four to five more times in the first 24 hours. 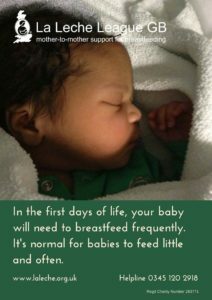 After that first 24 hours we know that babies who are getting adequate amounts of milk will wake to feed at least eight times over a 24-hour period (10 to 12 times being more likely) so it is valuable to keep an eye on numbers and offer feeds even if the baby does not seem to be actively asking. Babies need to feed frequently; this encourages the mother’s milk to increase in volume. Once your milk is coming in, after about 48 hours or so, you may hear your baby swallowing. You may also notice that your breasts feel fuller and that after your baby has fed they soften a little. Babies who are excessively sleepy, reluctant to wake or who only wake briefly and suckle for very short times will need some extra milk, and your colostrum is best. Learn how to hand express and give your expressed colostrum frequently, until your baby is waking, keen to latch and is doing active sucking and swallowing, with pauses. Your baby will be content and satisfied after most feeds and will come off the breast on his own. A period of cluster feeding each day (or night) is common. When a baby is cluster feeding he may be very keen to breastfeed a lot and not want to settle to sleep for three or four hours. However, if you feel he is never really satisfied after feeds, trust your instincts: some expressed milk might help. Seek help with positioning and attachment so that your baby can learn to extract milk efficiently himself. You can get support from LLL here. At first poo is sticky, black, and almost tar like. This will become greenish, less sticky, and wipe off your baby’s skin easier! By day three/four you will notice the poo change colour to mustard yellow, and it will be soft and seedy. Two or more of these poos every 24 hours are a sign your baby is getting enough milk in the early days. After three full days (72 hours) your baby should produce at least three poos per day. By five to six weeks your baby will develop his own pattern and may go days without a poo. Providing he is gaining weight ok, poos are no longer as important for being confident he is getting enough milk. At first your baby may not pass much urine but this increases each day. If you have had extra fluids during labour and birth your baby may produce extra urine for the first 24 hours or so. By day two look for two wet nappies over 24 hours, days three and four look for three or more wet nappies each 24 hours. By the time your baby is five days old, wet nappies should be more frequent, usually six or more over 24 hours. If your baby’s urine output is less than this or you see red/orange specks in your baby’s nappy, (these are called urates) your baby could do with some more milk. If you are worried your baby isn’t getting enough milk, consider hand expressing your milk. You can feed the expressed milk by teaspoon, cup or directly into his mouth. 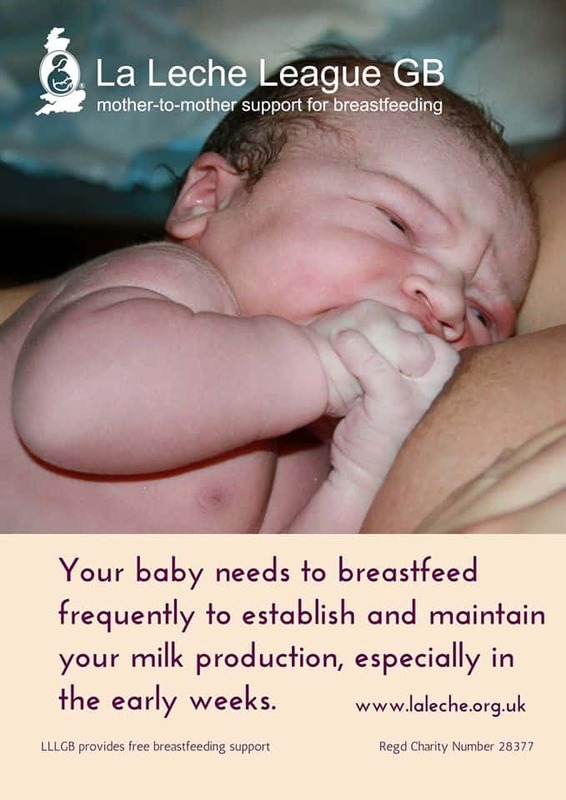 With some extra milk your baby will generally start to wake more and feed more actively. If you are concerned that your baby isn’t well contact your midwife or GP.